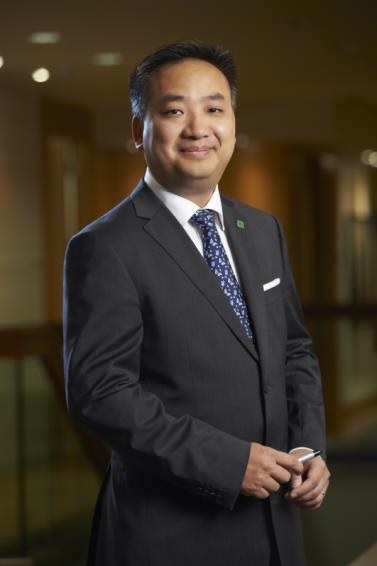 Kelvin Tran is Senior Vice President, TD Bank Group, and Chief Financial Officer, TD Securities. A results-driven executive with more than 13 years’ experience at TD, Kelvin values learning, mentoring, development and passing on best practices to aspiring young leaders. Kelvin leads the teams responsible for capital management, policies, planning and management reporting, analysis and control at TD Securities. Fluent in English, French and Cantonese, Kelvin is a graduate of Concordia University in Commerce and Accounting. He is also a Chartered Professional Accountant and a Chartered Financial Analyst. He is known as a change agent who builds high-performing teams. When he was a boy, Kelvin and his family arrived in Canada after surviving six days at sea and a refugee camp in Southeast Asia. He knows first-hand the challenges New Canadians face in adjusting to Canadian life, work and culture. He has made it part of his mission to pass on the lessons he’s learned along the way. As founding President and Chair of Ascend Canada, a leading non-profit organization, he is doing just that by helping develop the next generation of Pan-Asian leaders. Kelvin also believes it’s important to give back to the community. He is Director and Chair of the Audit Committee for the Canadian Diabetes Association. Kelvin lives in Markham with his wife and two children.